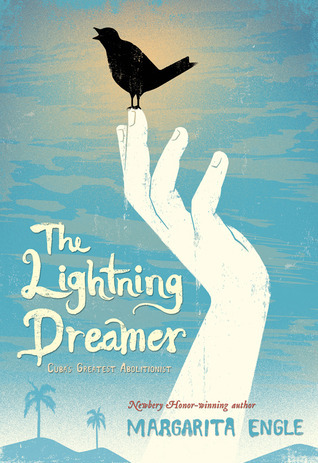 Written in free verse, The Lightning Dreamer is the story of Tula, a young girl growing up in Cuba in the mid-1800’s. Her full name was Gertrude Gomez de Avellaneda and we meet her in 1827 at age 13. Margarita Engle writes from Tula’s perspective, revealing her love of books and words. Tula’s father encouraged her love of stories; her mother and her mother’s new husband do not. Tula must hide what books she is able to get her hands on. She uses her younger brother Manuel to help disguise her books as his. Tula paints a vivid picture of her frustration in the societal constructs in which she lives. She is aware that slavery exists all around her because she can see the slaves of others walking by her home every day. Their housekeeper, Caridad, began with their family as a slave but was freed by Tula’s father. Caridad has continued on as a servant in Tula’s household. Tula is able to confide in Caridad when she cannot in her mother. Sent to the convent to teach her better behavior, the nuns provide Tula access to their HUGE library–which is NOT censored as are the ones controlled by the government and by the male population. It is here that Tula begins to realize that words can be MORE than the escape for which she uses them–making up stories of monsters and heroes in exciting and fanciful adventures. who was forced into exile. In my plays, all are equal. I seize the baby and hold him close. He falls silent, breathing against me. The father must be African. For a time Tula is without words–unable to conceive of any that will either express her thoughts and feelings or any that will make a difference. She doubts her own voice. The way in which she re-discovers her voice and begins to use it powerfully is an astounding, compelling and exciting story. Margarita Engle’s free verse makes this both an easy and exquisite read-aloud or independent read. The brief biographical information on Tula and on Heredia–as well as short excerpts from their poetry at the end of the book are a brilliant addition to feed the reader’s curiosity and newfound respect and awe for a main character whose strength vibrates throughout the pages.